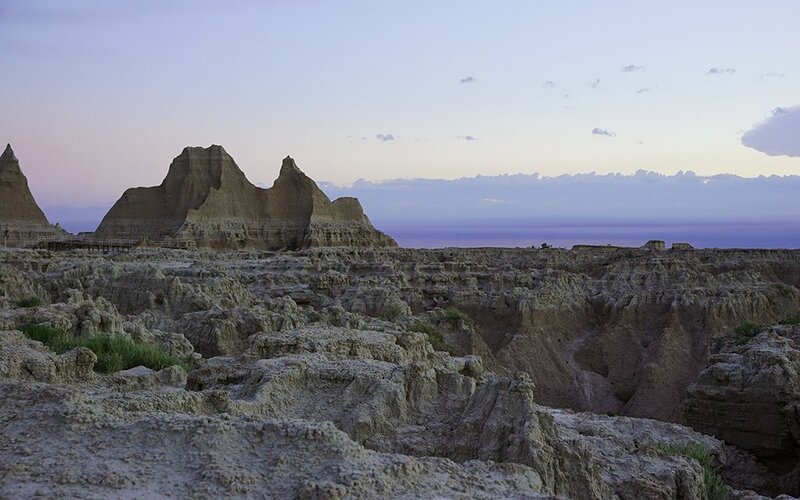 In the Badlands, the hours go by slowly. Everything does. Look no further than the eroded rock underfoot, sculpted over many millennia by wind, water and the sands of time. This is the thing about South Dakota: you’re always at the mercy of its size and emptiness. Find the right place, at the right moment, and you will, for at least a brief period, feel like you’re the last human on Earth. It also helps when it’s 3:45 in the morning. I’m on the east side of Badlands National Park, on the Door Trail, a quarter-mile hike that leads to and through “the door,” a natural break in the park’s hallmark showpiece: a hundred-mile stretch of multi-hued bluffs known around these parts as the “Wall.” After the first 150 yards of boardwalk, the trail turns into a vast overlook visitors are free to explore. The surrounding sedimentary cliffs engulf you. They are everywhere at the same time. I thought I had known what I was in for, having seen the pictures and spoken with friends who’d visited before me. They call them the “Radlands” for good reason, they assured me. But in person, the unruly assemblage of pinnacles, spires and buttes takes on a new dimension. Their size is amplified by their age, which you can literally see deposited in layers. 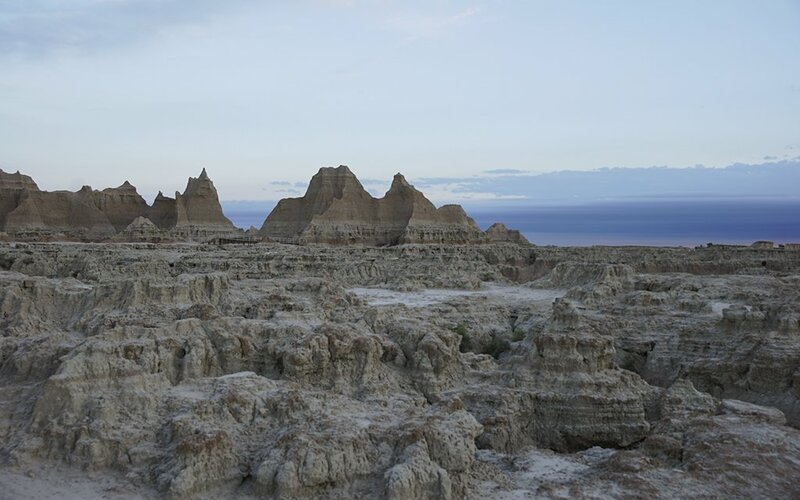 Plains Indians had inhabited the Badlands for 11,000 years; some 70 million years ago, the entire region was underwater. 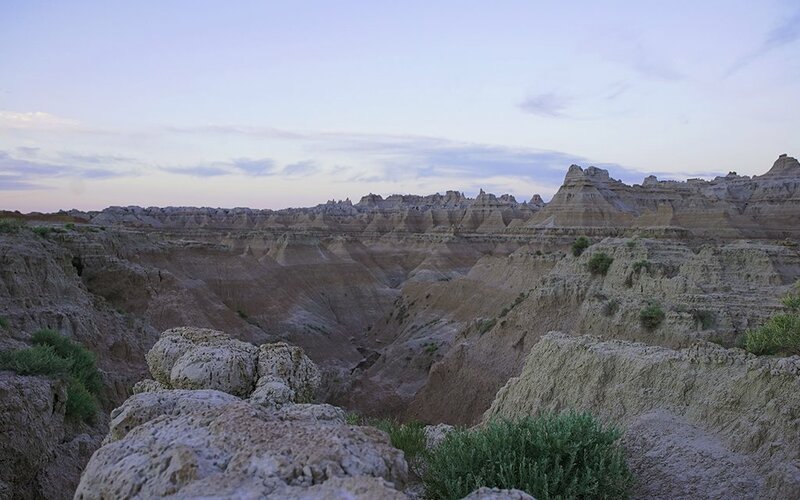 This isn’t my first time in the Badlands. I came here as an angsty teenager with a megaphone to his mouth, on a cross-country road trip to see — what else? — America. We drove to see Mount Rushmore. To see Crazy Horse. Wall Drug and The Black Hills. I had my learner’s permit but my pops didn’t let me drive. There was nothing for me to do here. There comes a time when you can comfortably admit wrongdoing in your past. And a sunrise over Badlands National Park — held against the time I couldn’t be forced out of the car on a family road trip — is one of them. The first thing you notice is the stillness. As the morning light increases, the formations begin to show their full color: sharp slopes and gullys change in shade and hue with each passing moment. Bands of cool greys and deep purples become yellows and burnt oranges. Dusty browns transform into a searing brick-red to compose a visual spectrum that might only be bested, in America, by the Grand Canyon. And if you let your eyes settle, cracks begin to appear, a reminder that within 500,000 years, this whole rock show will be completely gone. I don’t know what word can connect all my feelings; transcendence probably comes closest. Which makes sense. 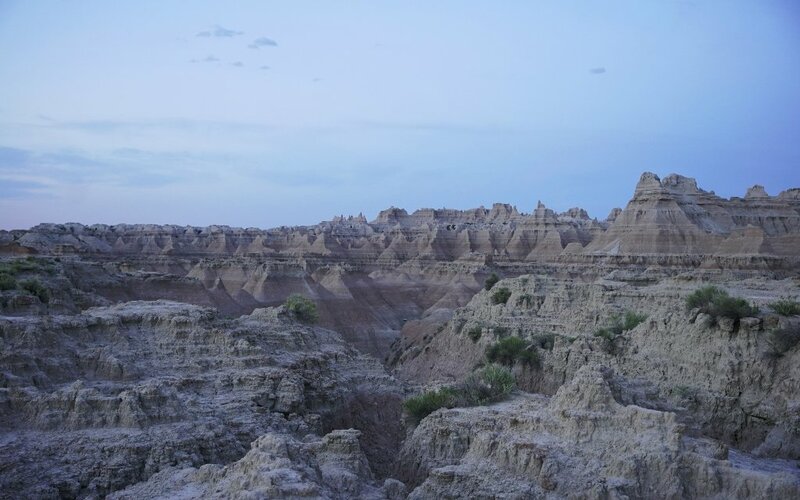 The Badlands, after all, have always been a sacred land for the Oglala Sioux Tribe and Plains Indians. 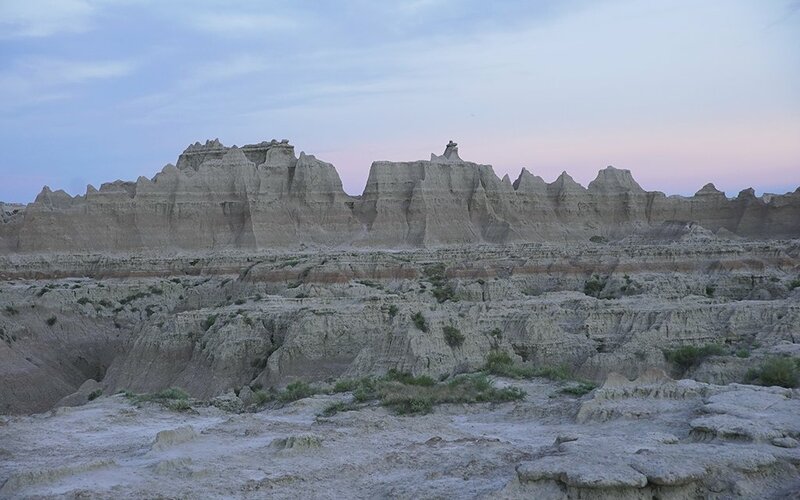 And while that narrative leads to conversations about our country’s troubled past (plans to give full management of the Southern Unit to the Oglala Sioux appear to be on rocky terrain), it doesn’t take away the spiritual significance this place holds. Tragically, it won’t always be like this. Hell, it won’t be like this — at least exactly like this — tomorrow. 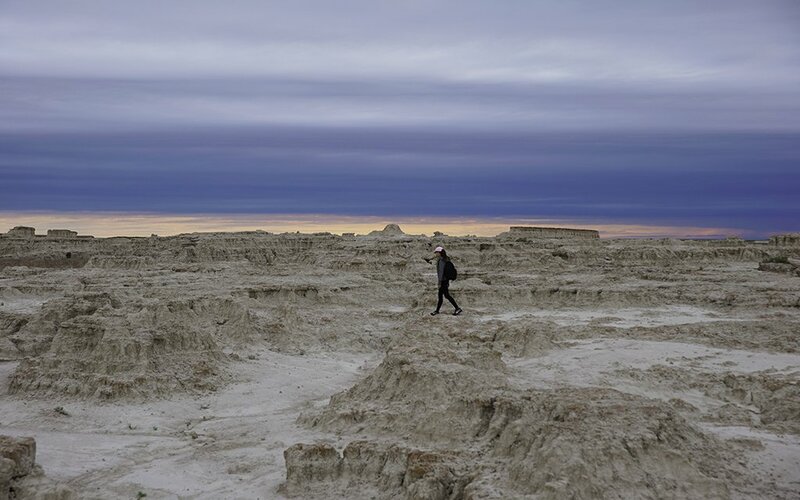 The truth is the Badlands feature one of the world’s most rapidly changing topographies. They average an inch of erosion each year. And one day, as mentioned, they’ll disappear altogether. But for now, this morning, they’re here, and I can’t think of a place I’d rather be.